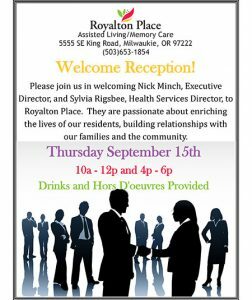 Come and meet our new Executive Director, Nick Minch, and Health Services Director, Sylvia Rigsbee at Royalton Place’s Welcome Reception. Refreshments and hors d’oeuvres provided. 10am to Noon and then again from 4pm to 6pm.